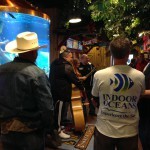 On November 13, 2014 ATM asked us to help with the install and maintenance of a 1,200-gallon aquarium system at the Hatfield McCoy Dinner Show in Pigeon Forge in one week. The owners wanted to replace an old moonshine still in the wait lobby with a moonshine still-shaped aquarium that would offer something spectacular for their customers while waiting in line for the show. Indoor Oceans was up for the challenge. The 1,200-gallon saltwater aquarium was going to be set up, installed and filled with fish in 1 day, while working around camera crews and production deadlines. Indoor Oceans oversaw the acclimation and introduction of the fish, maintained water parameters before, during and after filming. In addition, Indoor Oceans of Knoxville is now responsible for the ongoing maintenance of this custom 1,200-gallon aquarium lobby centerpiece. 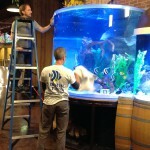 The aquarium install, TV production and the fish introduction went off without a hitch! The Hatfield McCoy dinner theater loves their new feature, along with everyone who walks into the lobby and is drawn to this one-of-a-kind moonshine still aquarium. The feuding families may be fighting in the dinner show, but all the fish seem to get along just fine! Indoor Oceans was thrilled to work alongside Wayde, Brett, Redneck and the rest of their team from Acrylic Tank Manufacturing (ATM) on this incredible project. 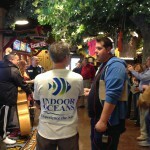 Indoor Oceans is also proud to be an affiliate of ATM. 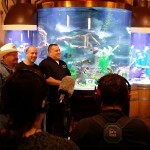 The “Tanked” episode appeared on Animal Plant on January 16th, 2015. 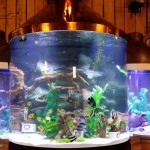 Custom 1,200 gallon Moonshine Still designed and installed by Acrylic Tank Manufacturing, with the assistance of Indoor Oceans. 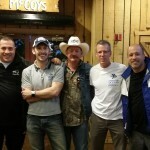 Wayde King (far L), Robert “Ronnie Redneck” Christlieb (middle) and Brett Raymer (far R) pictured with David (L), and Steve Temple (R), Indoor Oceans of Knoxville, as they wrap up an aquarium install for an Animal Planet’s “Tanked” episode. 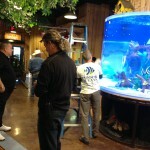 Redneck, Brett and Wayde thanking Indoor Oceans for their amazing work on the aquarium installation. Steve Temple, Indoor Oceans Knoxville Area Owner, inspects the tank before the installation of the moonshine still copper canopy. Steve Temple talks with production crew regarding taping schedule. 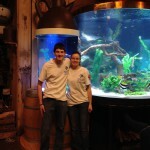 Joshua (L) and Adrienne (R) were part of the Indoor Oceans of Knoxville team that assisted with the tank installation.